It's finally here! February 13 - 15, 2015, the Southeastern Wildlife Exposition has grown to be the largest event of its kind in the nation, attracting over 500 artists and exhibitors from around the globe who present their offerings to over 40,000 attendees. A 3-day celebration of nature that has earned a reputation for excellence, SEWE now hosts the world's foremost experts in wildlife and nature art, as well as conservation research and environmental education. 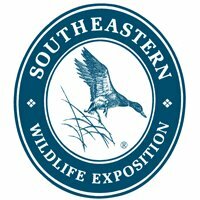 Established in 1982, the first Southeastern Wildlife Exposition took place in February of 1983, with approximately 100 exhibitors and 5,000 people in attendance. Its goal was, and is, to produce an event which contributes significantly to the economy while promoting the conservation and preservation of nature and wildlife through its educational outreach programs and its focus on the visual arts. The Southeastern Wildlife Exposition is a critical part of the South Carolina and Charleston calendar. Run with the utmost professionalism and pride, an effort that began as a small winter diversion has now become the largest annual event to take place in South Carolina and one of the most popular and successful events in the country.